When I look at the waveform of a vocal recording, it looks lop-sided, with the waveform going further above the zero-crossing point than it goes below it. It sounds fine, though, so what's happening here? This is a naturally occurring asymmetrical waveform, built from the linear sum of a cosine fundamental and its first four harmonics (created in Adobe Audition). 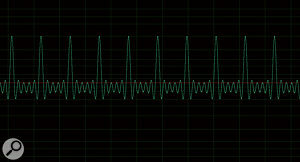 In this image we can see that as the waveform amplitude decays, it settles on the zero line (red). There is no DC offset. This simple sine wave has a DC offset, which raises the centre of the sine wave well above the zero line. 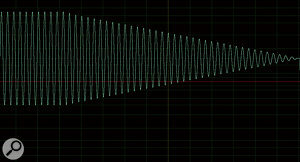 As the waveform amplitude decays, it remains well above the zero line. This is the typical phase response of a 'phase rotator', which can be used to impose symmetry on asymmetrical waveforms by adjusting the phase relationships between fundamentals and harmonics. An increasing negative phase shift is applied progressively as the signal frequency increases, with the highest frequencies being shifted a full 360 degrees relative to the lowest frequencies. SOS Technical Editor Hugh Robjohns replies: This kind of asymmetrical waveform is quite natural and normal, and is particularly common on recordings of speech and vocals, brass instruments, and sometimes also closely miked strings. A lot of percussive sounds are also strikingly asymmetrical, of course. In the 'BC' era (Before Computers) we didn't look at waveforms, we just listened to them, and this kind of asymmetry was generally inaudible and didn't bother us, although some people are sensitive to absolute polarity, and can actually tell if an asymmetrical waveform is inverted. Waveform asymmetry has been known about for a very long time, and in the few areas where it can be an issue (such as in broadcast processing), technology has long been in place to deal with it. However, since the prevalence of the DAW and its ubiquitous waveform display, a lot of people have become aware of it and asked the same question. Confusingly — and erroneously — this natural waveform asymmetry is often attributed to a 'DC offset', but that's not the case at all. A DC offset is a specific fault condition where the varying AC audio signal voltage is offset by a constant DC voltage, and the 'tell-tale' is that, although the waveform might look asymmetrical, a decaying signal waveform settles away (offset) from the centre zero-line. DC offsets are virtually unheard-of these days, but can occur in hardware analogue electronics under fault conditions. In the digital world, very early multi-bit A-D converters sometimes suffered a problem in the quantiser that essentially resulted in encoding a fixed-level shift or offset onto the audio sample values — the digital equivalent of an analogue DC offset. However, a DC offset can be very easily corrected by passing the audio through a high-pass filter tuned to a low frequency (typically 10Hz or lower). It is important to correct DC offsets when they do occur, because editing between an audio clip with a DC offset and one without results in a loud thump or plop at the edit point, which is not good! In contrast, natural waveform asymmetry cannot be 'corrected' with a high-pass filter, and a rather more complicated solution is required called a 'phase rotator'. 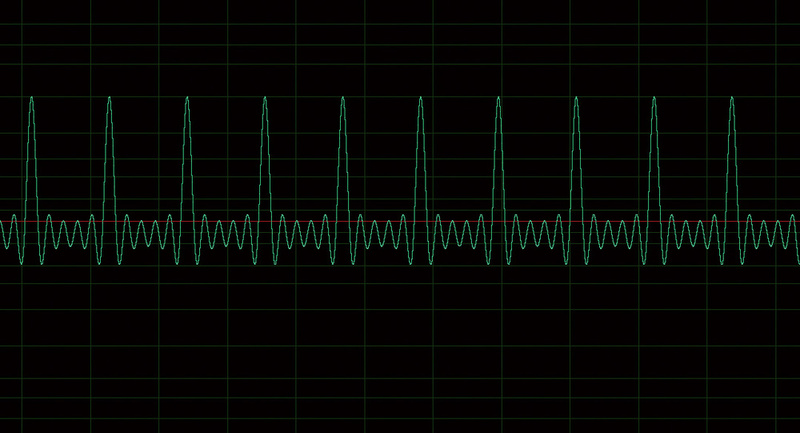 Generally, there is no need to 'correct' a naturally asymmetrical signal, but occasionally the asymmetry can restrict how much the signal can be amplified because the stronger half of the waveform will reach the clip level before the weaker side. By using a phase rotator process to alter the harmonic phase relationships, a more balanced symmetry can be established, allowing slightly more gain to be applied before both sides reach the clipping level at the same amplitude. 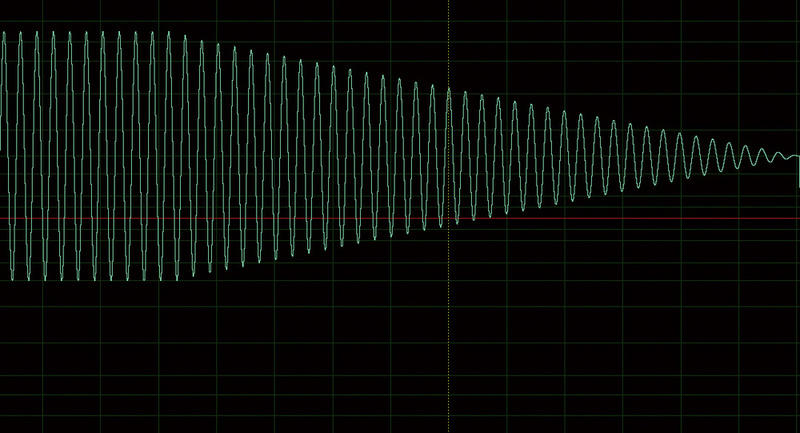 Asymmetrical waveforms can also sometimes confuse the side-chain level-detection circuitry (or algorithms) of some compressors, resulting in less effective compression than might be expected.